Reinforcing pavement layers with geosynthetics improve the pavement performance significantly. In addition to the use of geosynthetics, the hexagonal–steel–wire mesh has gained popularity as a reinforcing material in pavements. The interface shear property of pavement material and reinforcement is an important input parameter in numerical modeling of the reinforced pavement system. 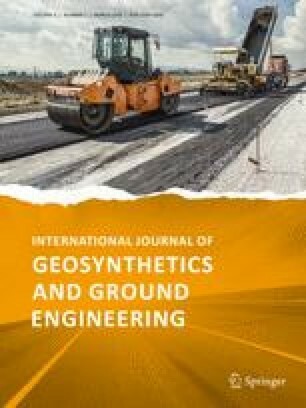 In this study, the interface shear parameters of various pavement materials, namely poor subgrade, fair subgrade, gravel base (GB), and gravel surface (GS) with geogrid and hexagonal–wire–mesh reinforcements is obtained using large-size direct shear test apparatus. GS and GB mixes are selected from Indian rural roads specification of unpaved surface and base layers of the pavement. In addition, the effect of the size of the aperture of geogrid reinforcement on interface properties is studied by considering two types of biaxial geogrids of different aperture sizes. The interface shear strength and interaction coefficients of different reinforcement types with pavement materials are also proposed. The interaction coefficients of three reinforcement types with the pavement materials considered in the study are found to range from 0.82 to 1.45. The interface shear modulus of different interfaces considered in this study ranges from about 12165–57337 kPa/m corresponding to normal streeses in the range of 30–90 kPa. Authors would like to thank Strata Geosystems (India) Pvt. Ltd. for supplying geogrids and Maccaferri Environmental Solutions (India) Pvt. Ltd. for supplying Road Mesh for experiments. The first author would like to thank Head-CED and the Principal of MVSR Engineering College, Hyderabad, for permitting to conduct research work at IIT Hyderabad.